1 Ben had been outside helping his mother. She wanted to attract hummingbirds to their garden. Ben liked them, too. 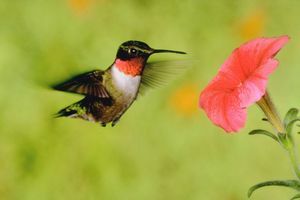 He especially liked the ruby-throated hummingbird. 2 The kitchen window looked out over a wide flower bed. It was planted with bee balm, cardinal flowers, and columbine. Climbing up the side of the house was a well-established trumpet honeysuckle plant. The flower bed extended from under the kitchen window past the dining room and bathroom windows. 3 Ben and his mother had been busy. Empty places in the flower bed had been filled with more plants that might tempt the jewel-colored birds. He wanted to wipe the sweat from his forehead, but he knew he'd leave a muddy streak in its place. 4 He carefully went into the house to wash up. He kicked off his dirty shoes just inside the door. His stocking feet made little noise as he hurried to the bathroom to wash up. 5 He flipped on the light switch with his elbow and shut the door. He started to turn on the water when he noticed a frantic, tiny bird darting about inside the room. 6 Ben was afraid it would crash into the mirror and injure itself. He flipped off the light and ducked down low beside the sink. He could hear his mother coming down the hallway toward the bathroom. He shifted position so he could open the door a bit. "Mom," he called softly. "There's a hummer in the bathroom!" 7 "Let me see," she said, pushing gently on the door. Mom eased the door open just enough to stick her head in the room. She smiled when she saw the little bird, no bigger than her thumb. "Just stay down, Ben. He'll calm down and figure out how to get back out through the window," said Mom. "I'll ask Dad to get that window screen replaced tonight." 8 "Why do you think he came in?" asked Ben. 9 "I think he saw those red flowers in the wallpaper and wanted to check them out. Ooh, there he goes," she said with a sigh. Feedback on There's a Hummer in the Bathroom!